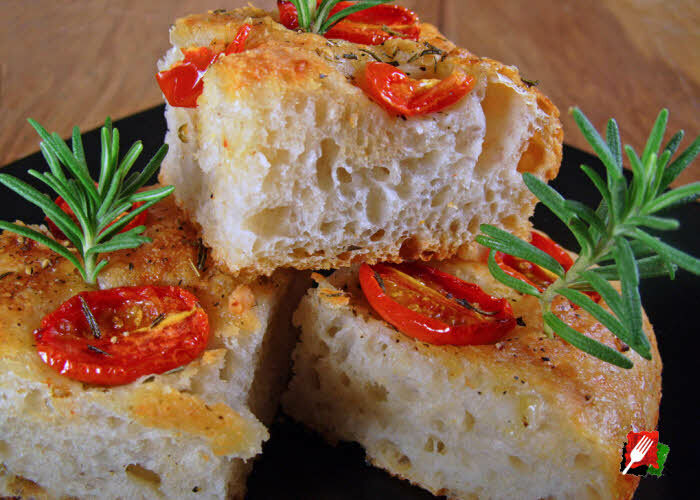 Easy to Make ItalyMax No-Knead Bread Recipe For Crusty Artisan Bread, Pizzas, and More! Our most popular recipe! 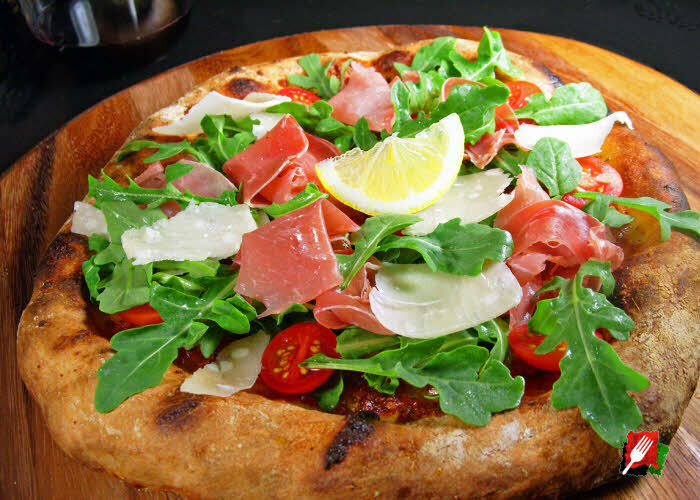 This foolproof make-at-home, no-knead bread dough recipe allows you to use your own oven to easily bake rustic artisan bread, focaccia bread, burger buns, and the best artisan pizzas that even most bakeries and pizzerias can’t duplicate. This versatile recipe delivers incredible flavor using only four ingredients that cost less than 50 cents per loaf! 2. When the first fermentation is complete, dust your work surface with flour. 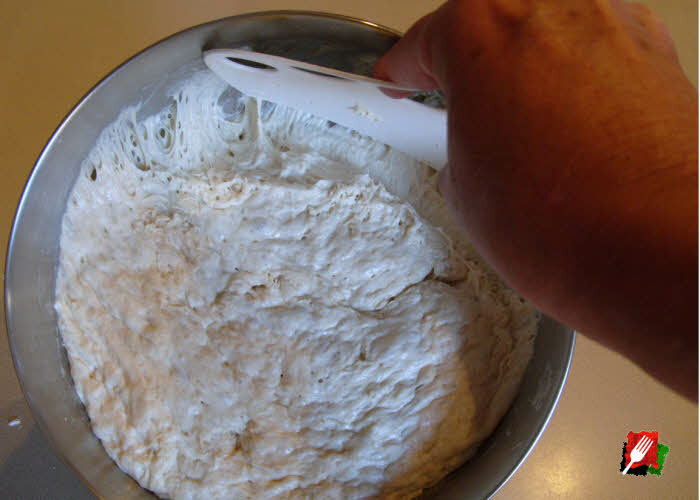 Remove the plastic wrap from the bowl and lean the bowl at a 45 degree angle to slowly “pour” out the dough onto the floured surface. Use a plastic scraper if necessary, but try to keep the dough in one piece. The dough will be extremely loose, clingy and sticky. Dust the dough lightly, and with floured hands, fold under each of the four sides of the dough toward the center. Nudge and tuck in the edges of the dough to shape it into a round or long loaf, then place with the tucked seam side down to proof on the lightly floured surface. Place a moistened cotton kitchen towel (not terry cloth) loosely over the dough to cover then let it rise in a warm area for another 60 to 90 minutes. The dough is ready when it doubles in size. If you press it with your finger, it should hold the impression. If not, let it rise for an additional 15 minutes. 3. About a half hour before the dough has finished its second rise, move your oven rack to the middle position, place a heavy pot or Dutch oven in the center of the rack, and preheat the oven to 475 degrees. 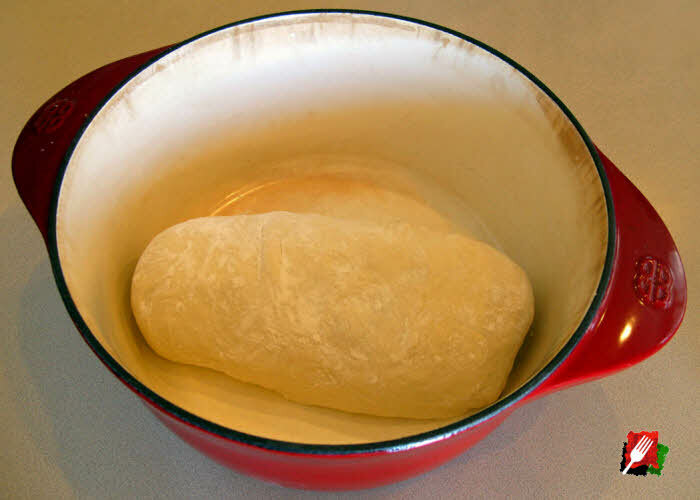 After 30 minutes when the oven and pot are preheated, score the dough with 3 angled slits across the top with a serrated bread knife for a loaf (or cut an “X” across the top for a round), then carefully remove the hot pot and gently place the dough in the pot. Cover and bake for 30 minutes.3 Remove the lid and continue baking for another 10 to 15 minutes until the bread is a deep chestnut color, but not burned. You can also check it with an instant read thermometer. 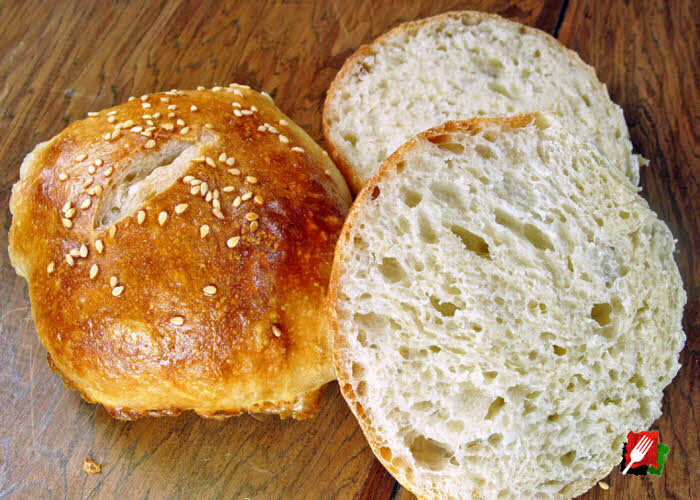 Your bread should be done when the internal temperature reaches 195°F. When the bread is done, carefully remove the loaf from the hot pot and place it on a wire rack to cool for at least 20 minutes before slicing. 3. For a full 30 ounce loaf, bake for 30 minutes, then remove the lid and bake for an additional 10 to 15 minutes. If you are baking a 20 ounce loaf, bake for 20 minutes, then remove the lid and bake for an additional 5 to 10 minutes, or until bread is done but not burned. You can also use an instant read thermometer. 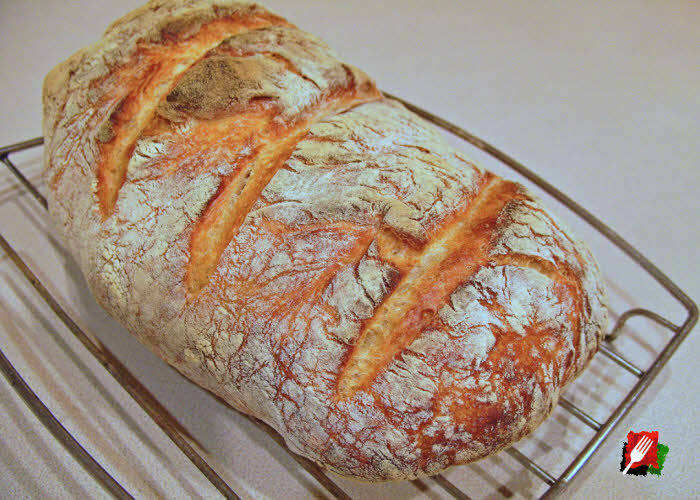 Your bread should be done when the internal temperature reaches 195°F.